Abdullah Ensour (/ˈɑːbdələ ɛnˈsʊər/ ( listen) AHB-də-lə en-SOOR; Arabic: عبد الله النسور‎ ʿAbd Allāh an-Nasūr; born 20 January 1939) is a Jordanian economist who was Prime Minister of Jordan between October 2012 and May 2016. 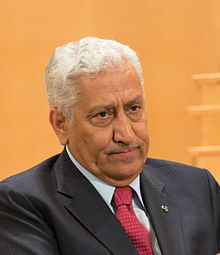 A veteran politician, he has held various cabinet positions in Jordanian government in addition to being prime minister. Chairman of the Finance and Economic Committee. Member of the Foreign Affairs Committee. Member of the Committee on Education and Higher Education. Minister of Industry and Trade. Director General of the Budget Department. The Ministry of Finance Secretary General. Director General of the Income Tax Department. Governor of Jordan at the World Bank. Deputy Governor of Jordan at the International Monetary Fund. Jordan's permanent delegate to UNESCO. Chairman of the Jordanian-French Business Club Management. Member of the Royal Commission National Ajenda. Chairman of the Royal Commission to strengthen national integrity system. The official spokesman and a member of the Royal Commission for Jordan First. Chairman of the Higher Education Council. Chairman of the Board of Trustees of the University of Jordan Zaitouna. Vice Chairman of the Board of Trustees of the University of Science and Technology. Vice Chairman of the Board of Trustees of the Balqa Applied University. Vice Chairman of the Board of Trustees of the Hashemite University. Member of the Board of Trustees of the University of Jordan. Member of the Board of Rights in the University of Jordan. Administrative and Financial Director of the Royal Scientific Society. Member of the National Commission for Development Planning. Chairman of the Supreme Council for the fight against illiteracy. Chairman of the Cement Company. Vice Chairman of the phosphate company. Vice Chairman of the Iraqi Jordanian Land Transport Company. Member of the Board of Management of Bank of Jordan. Member of the Council of Arab African International Bank. Member of the Council of Arab Company for Investment Management. Member of the Board of Directors of Aqaba Railway. Member of the Board of Royal Jordanian Management. Member of the Board of Jordan Investment Corporation management. Member of the Board of Management the authority of the port of Aqaba. Member of the Board of Jordan Enterprise Manager for the development of economic projects. Board Member of Emaar Salt Foundation. Board Member of the Noor Al Hussein Foundation. Board Member of the Queen Alia Fund Management. Chairman of the newspaper Voice of the People. Chairman of the Board of Directors Haya Cultural Center. Chairman of the graduates of French universities Club. Member of the Board graduates of American universities Club. Teacher and director in the Ministry of Education. Ensour was first elected as a deputy to the Jordanian Parliament in 1989, again in 1992, and a third time in 2010[clarification needed]. His first ministerial post was as Minister of Planning in 1984. He then became Minister of Planning again in 1985; he also served as Minister of Education (1989); Minister of Foreign Affairs (1991); Minister of Industry and Trade (1993); Minister of Higher Education (1996); Deputy Prime Minister and Minister of Administrative Development (1997); and Deputy Prime Minister and Minister of Information (1998). He also served in the parliament in the lower house of representatives from 1989 to 2001. Ensour was also governor of Jordan to the World Bank, deputy of Jordan to the International Monetary Fund and deputy permanent delegate to UNESCO; he sits on a number of boards including the Arab African Bank, Nuackchott (President); the University of Jordan (Vice-President); and the French Universities' Graduates in Jordan (Honorary President). In October 2012, he was appointed as Prime Minister by King Abdullah II, replacing Fayez Tarawneh. After general elections in January 2013, King Abdullah reappointed Ensour as Prime Minister on 9 March 2013. His second cabinet was sworn in on 30 March 2013. His term ended on 29 May 2016. Ensour is a member of Prague Society for International Cooperation, a respected NGO whose main goals are networking and the development of a new generation of responsible, well-informed leaders and thinkers. Ensour married twice. His first wife, Ms. Hala Khleifat, from whom he has three children with, died in 2015. Ensour's second marriage was to Ms. Ibtissam Hiary, from whom he has 5 children. Istiqlal Medal of the First Order. Kawkab Medal of the First Order. ^ a b Hazaimeh, Hana (10 October 2012). "Abdullah Ensour to head new government". The Jordan Times. Archived from the original on 30 January 2013. Retrieved 29 January 2013. ^ a b "Index E". Rulers. Retrieved 26 July 2013. ^ "King Hussein warns of 'destructive darkness' unless peace talks progress". Jerusalem Post. 21 April 1998. Archived from the original on 4 November 2012. Retrieved 16 June 2010. ^ Al-Khalidi, Suleiman (9 March 2013). "Jordan's King Abdullah reappoints Ensour as PM". Reuters. Amman. Retrieved 10 March 2013. ^ "Ensour 19-member Cabinet sworn in". The Jordan Times. 30 March 2013. Archived from the original on 20 December 2014. Retrieved 29 June 2013. ^ "King dissolves House, appoints Mulki as new premier". The Jordan Times. 29 May 2016. Retrieved 2 June 2016. ^ "Members of Prague Society". Archived from the original on 19 September 2015. Retrieved 19 August 2015. ^ a b "Profiles of new ministers". World economic forum website. Archived from the original on 14 July 2014. Retrieved 2 July 2014. ^ "Profiles of new ministers" (PDF). Jordan Times. Archived from the original (PDF) on 18 April 2013. Retrieved 18 July 2013. ^ "Profiles of new ministers". Prime-ministry of Jordan website. Retrieved 2 July 2014. Wikimedia Commons has media related to Abdullah Ensour.